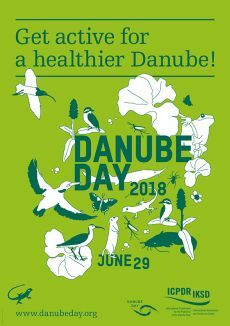 Get active for a healthier Danube in Bratislava, Gabčikovo and across Slovakia! Around 3,500 people enjoyed three family festivals in Slovakia during 2018. New for 2018 was a festival at the Water Works Museum in Bratislava. This kick-started the celebrations with creative workshops, films and face-painting. The morning brought a Magic Physics show, eco activities and the chance to meet Danube creatures face-to-face. In the afternoon, children enjoyed Danube story-telling and films about river conservation. The awarding of 2018’s Danube Art Master also took place. The Slovakian round of the 14-country art extravaganza was organised by the NGO, BROZ. Winners go onto the International final later in the year. See the facebook pages of event hosts: WWF Slovakia, BROZ and the Bratislava Water Company Museum or the website of the Slovak Academy of Science for further details. Another highlight was Danube Day at the Environment Ministry. TV celebrity, Thomas Puskailer was joined by showbiz friends for the ECO H20 Tour, which entertainingly explaining the 'whys' and 'hows' of water conservation to a packed room of children. The next day brought an exhilarating International Danube Day at Gabčíkovo Dam. The annual event featured river cruises, rescue demonstrations and virtual wildwater kayaking. There was lots for kids including massive foam show, archery contest and funny photo-shoot. Slovak bands, theatre and folk music were showcased on the stage, and young children were thrilled by the Circus of the Giants! You could learn about water and river issues from experts during free tours of the hydropower plant and at stands throughout the site. The weekend of activities was organised by Vodohospodárska výstavba, Slovenský vodohospodársky podnik and the Ministry of Environment. Volunteers also get active for the Danube in a mass litter clearance campaign in 40 locations across Slovakia. Towns involved included Štúrovo, Komárno, Gabčíkovo, Kalinkovo, Medveďov, and districts of Bratislava. To see how all the countries celebrated in 2018, go to Review 2018. You can also revisit 15 years of Slovak Danube Day via the general Review page. Tomáš Hajdin of the Water Research Institute on +421 2 59 343 358; tomas.hajdin@vuvh.sk. For news of Slovakia's Danube Art Master contest, contact Žofia Filagová of BROZ on +421 948 370 437; filagova@broz.sk.